Download "Waste Oil Collection / Storage"
4 Page 4 fresh product petroleum tanks will have a very low level of functionality on waste oil tanks. Manual tank gauging and routine scheduled waste oil pickup for recycle appears to be adequate to prevent overfill. The threat of leakage from pipe corrosion appears to be minimal on the typical UST waste oil collection system installed with a significant pipe slope to the tank. The waste oil tank must be provided with corrosion protection and many owners are providing existing USTs with CP protection by impressed current systems, which will also protect the piping. 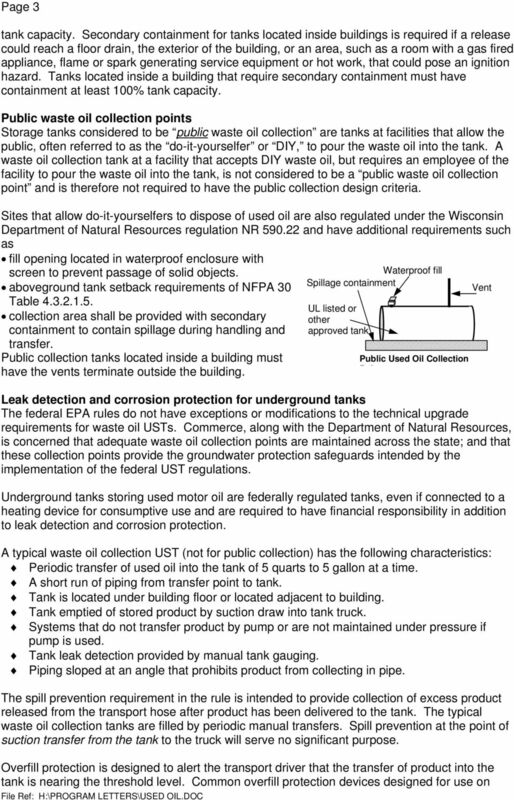 The Wisconsin UST program has made an upgrade provision for non-public waste oil tanks: Tank receiving product in 25 gallon or less quantities by manual transfer into the tank and suction transfer from the tank, will be excluded from spill and overfill requirements. 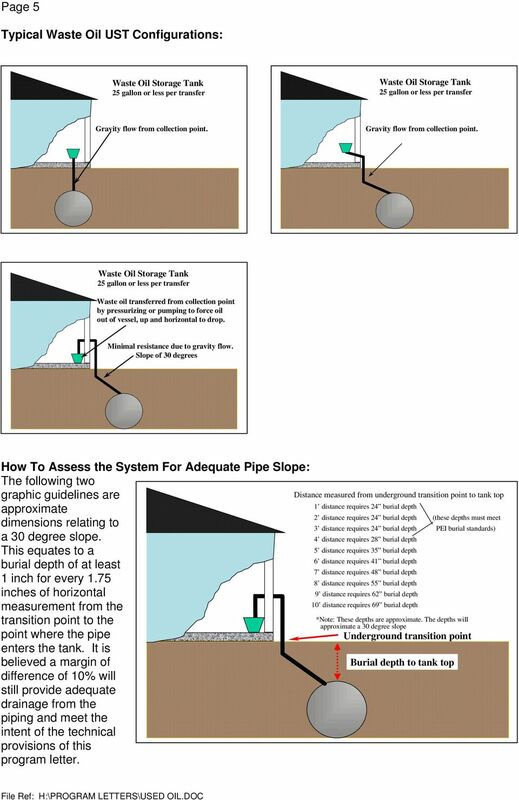 Tank receiving product in 25 gallon or less quantities by manual transfer, having underground piping that is sloped at least a 30 0 angle, will be excluded from corrosion protection on the pipe. (Refer to diagrams at end of article.) Individual waste oil storage tank system management and system design may dictate a more restrictive approach to the provisions mentioned. These provisions were developed after considering industry's discussion relating to the typical differences between waste oil collection systems and fuel transfer systems. The discussions included the logic of need in relation to functionality, cost, and intent of the federal rule. This provision does not reduce the UST owners liability or responsibility in the event of a leak and subsequent environmental contamination resulting from spillage or leakage. 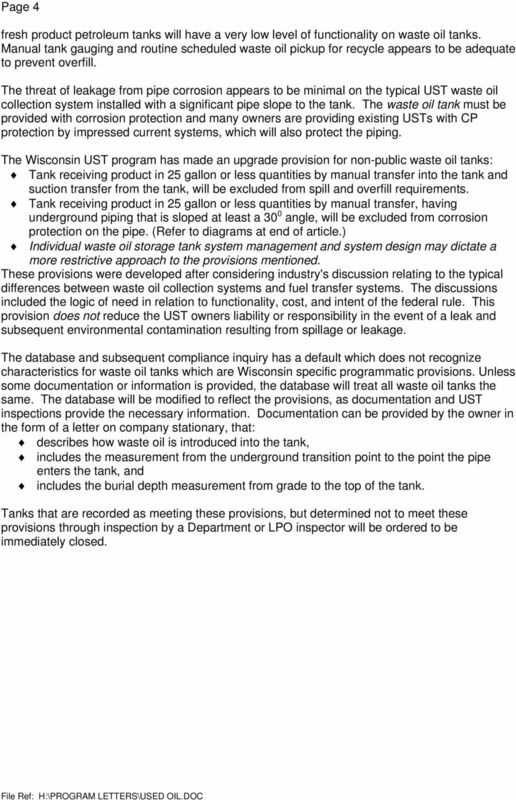 The database and subsequent compliance inquiry has a default which does not recognize characteristics for waste oil tanks which are Wisconsin specific programmatic provisions. 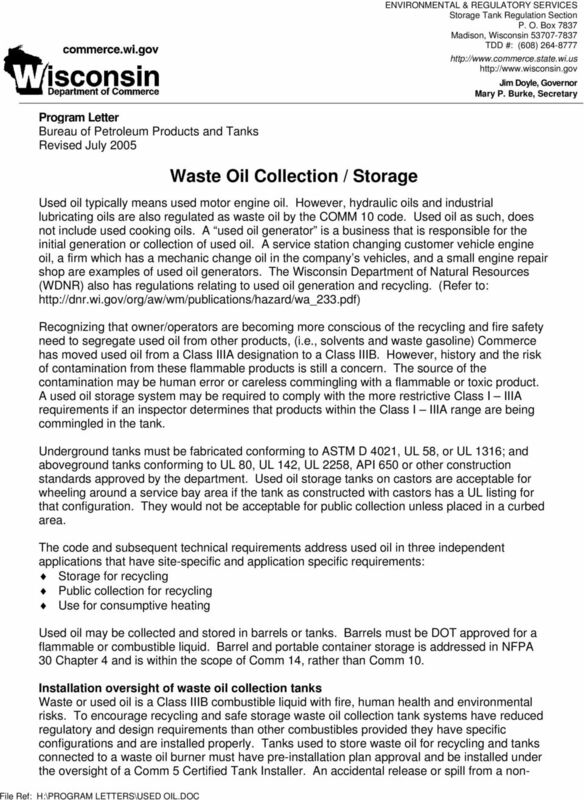 Unless some documentation or information is provided, the database will treat all waste oil tanks the same. The database will be modified to reflect the provisions, as documentation and UST inspections provide the necessary information. 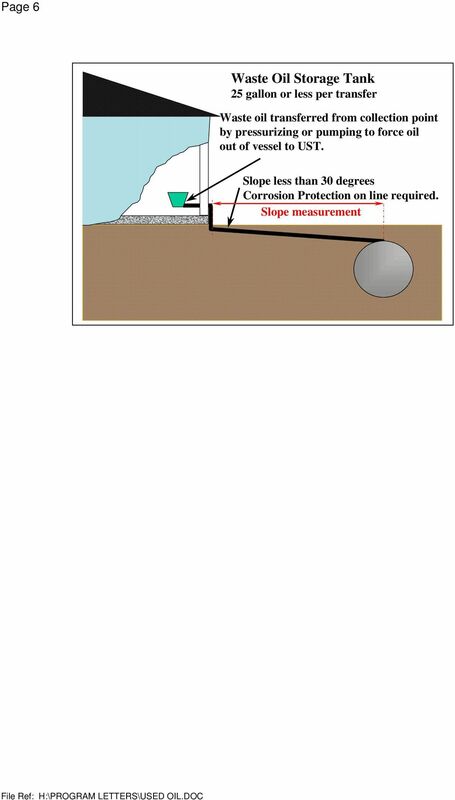 Documentation can be provided by the owner in the form of a letter on company stationary, that: describes how waste oil is introduced into the tank, includes the measurement from the underground transition point to the point the pipe enters the tank, and includes the burial depth measurement from grade to the top of the tank. Tanks that are recorded as meeting these provisions, but determined not to meet these provisions through inspection by a Department or LPO inspector will be ordered to be immediately closed. STRATEGIC OUTCOMES PRACTICE TECHNICAL ADVISORY BULLETIN January 2010 MOTOR FUEL DISPENSING SAFETY Fire! Not an alarm anyone wants to hear, especially not when the fire is burning at a major fuel source. Oil Control Program. OIL OPERATIONS PERMIT APPLICATION FORM A Storage, Transfer and Delivery of Oil within the State of Maryland. 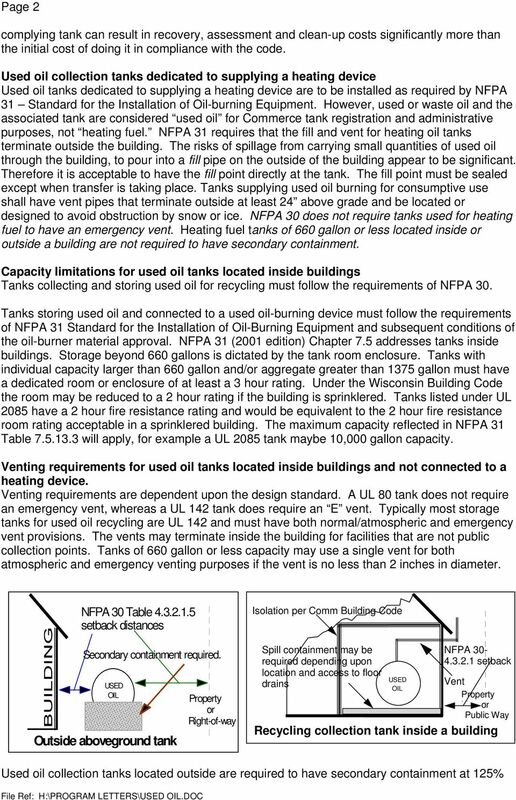 CHAPTER 10 BOILERS, WATER HEATERS AND PRESSURE VESSELS SECTION 1001 GENERAL 1001.1 Scope. This chapter shall govern the installation, alteration and repair of boilers, water heaters and pressure vessels. Flammable liquid classes: Combustible Liquid Classes. Class IC. Class II. Class IB F.P. below 22.8 C (73 F), boiling point at or above 37.